Prairie grass near Urbana, Illinois, on October 13. “There’s too much that no one is watching,” said Kim Erndt-Pitcher, a habitat and agriculture programs specialist at Prairie Rivers Network, a nonprofit advocacy group for clean water in Illinois. Erndt-Pitcher said that as dicamba drifted and harmed an estimated 600,000 acres of soybeans in Illinois in 2017, it’s likely that much of the habitat for endangered species and monarch butterflies was also damaged. The herbicide has the potential to increase stress to the state’s already limited prairieland, some of which borders agricultural fields. Today, just over 2,000 untouched acres of prairie remain across Illinois, and these provide rare habitats for the plants and wildlife that were spread across Illinois’ 22 million acres of prairie two centuries ago. Monsanto and German chemical company BASF developed new formulations of dicamba that were touted to less likely to drift. The products were approved by the U.S. Environmental Protection Agency in November 2016 and sprayed for the first time in 2017. Several states received record complaints about pesticide drift in 2017, and University of Missouri weed scientist Kevin Bradley estimated that 3.6 million acres of soybeans were damaged by dicamba drift in 25 states. Damage was also documented at natural areas, on oak trees and other specialty farms across the Midwest and South. But the extent of the problem is unknown, environmentalists said, because there aren’t people out looking for damage in most natural areas. 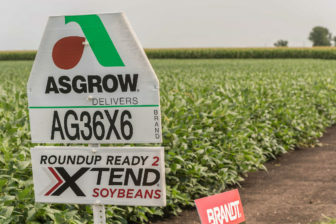 The need for new herbicides that could be sprayed on soybeans emerged after many weeds developed resistance to glyphosate, the most commonly used herbicide, which is made by Monsanto. In response, Monsanto developed genetically modified soybeans that could be sprayed by dicamba, a very volatile herbicide that traditionally kills broadleaf plants like soybeans. The U.S. EPA increased regulation on dicamba in October after the widespread damage reports. It named dicamba a restricted use pesticide, which imposes more regulations on those applying it. It also limited the conditions in which dicamba can be sprayed. Several states, including Arkansas, Missouri, Indiana and Minnesota, have taken additional action. But the new restrictions do not further protect natural areas. The agency had already required a downwind buffer zone to protect habitats that are home to endangered species. 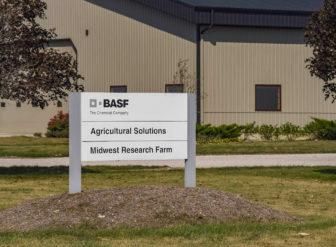 A BASF research office in Champaign County. Monsanto spokeswoman Charla Lord emailed: “Thanks for reaching out. You can find information about Monsanto at www.monsanto.com”, when sent an email with questions about the issue. “Monarchs are declining, and milkweed is their only source of food, so we are certainly committed to helping growers sustain milkweed in non-crop areas,” Hines said. Hines said dicamba was effective in 2017, and while drift issues are “concerning,” the company will work to help applicators properly use the herbicide. By 2019, more than 60 million acres of the monarch butterfly’s migratory habitat in the South and Midwest will be harmed by drift from the herbicide dicamba, according to a report from the Center for Biological Diversity, a nonprofit organization that advocates for endangered species. “This has the potential to sort of escalate in the way glyphosate did,” said Donley, an author of the report. The Center for Biological Diversity filed a complaint in 2014 to the U.S. Fish and Wildlife Service, prompting an investigation into whether the monarch, whose population has dropped 80 percent in the past 20 years, is endangered. The service has until 2019 to make a determination. Darrell Hoemann/Midwest Center for Investigative Reporting Dicamba resistant soybeans in rural McLean County on August 7. The use pattern of dicamba corresponds almost directly with the migratory habits of the monarch butterfly, so that when the species is in a certain area, it’s likely that would be near the peak usage of dicamba, Donley said. The Midwest is in the middle of the flyway for monarch butterflies, providing habitat for the butterflies as they travel between Mexico and southern Canada. Monarchs must go through multiple generations in order to complete this migration, so they need to be able to lay eggs throughout the season. They can only lay eggs in milkweed plants. Much of the “super generation” of monarchs that completes the migration to Mexico and lives through the winter is born in the Midwest. Currently, the effect of dicamba on pollinators is largely unknown, though much research points to potential loss of habitat, Donley said. Research from the U.S. EPA has found that in some ways, milkweed is more susceptible to damage from dicamba than glyphosate. Dicamba drift makes milkweed less likely to flower and pollinators are less likely to visit plants affected by drift, Penn State researchers found. Robert Hartzler, a weed science professor at Iowa State University, found that Monarch butterflies are just as likely to lay eggs on distorted milkweed plants as they are on healthy milkweed. But Hartzler said dicamba damage year after year could have a long-term harmful effect on milkweed. The monarch is not the only pollinator affected. Invertebrates and insects like crickets, grasshoppers and bees rely on many prairie plants to survive. These species pollinate and also provide a food source for small mammals and native and migratory birds. The U.S. Environmental Protection Agency found that 812 endangered species of plants and animals in 34 states were likely to be affected by drift from dicamba, according to federal documents. However, in its final registration for the new formulations in November 2016, the agency determined there would be no drift with the new versions, so it would have “no effect” on these species. Richard Coy, vice president of Coy’s Honey Farm in Arkansas, said that he had significant issues with bee hive loss in 2017, particularly near fields that had been sprayed with dicamba. He said he saw as much loss as 50 percent of his hives. The Illinois habitats are largely found in places highly susceptible to drift from soybean fields – in medians between roads and agricultural fields, alongside railroad tracks and on hill prairies, which provide habitats for prairie plants and sensitive species. “These habitats and these plant species are critical for Illinois wildlife and not just Illinois wildlife but also migratory wildlife,” Erndt-Pitcher said. Records obtained via the Freedom of Information Act show that the Illinois Department of Natural Resources and Illinois Nature Preserves Commission are aware of damage from dicamba drift in at least four parks or nature preserves protected by the state. 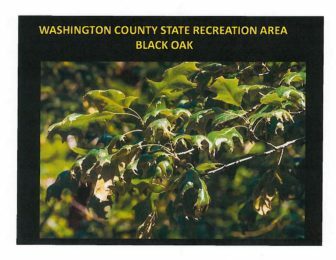 llinois Department of Natural Resources A black oak at the Washington County State Recreation Area shows signs of damage from dicamba. This was obtained via a Freedom of Information Act. Edward Cross, a spokesman for the DNR, said the department received reports of drift from field staff and private landowners. “To obtain a more accurate picture of potential effects, the Department is developing a protocol for all staff to follow during the 2018 growing season. The IDNR wants to be certain staff are able to accurately and completely document any suspected pesticide damage to native plants and trees on state-owned and managed sites,” Cross said. He said the agency is working with the Illinois Department of Agriculture on its protocol. He said the department will share its protocol and provide training for land trusts and conservation groups so they can accurately document any damage they may observe. Jen Walling, the executive director of the Illinois Environmental Council, which represents more than 80 environmental and community organizations, said she heard complaints about dicamba drift from environmentalists across the state. “Most years, it’s usually just one group that complains, but this year it was so widespread,” Walling said.